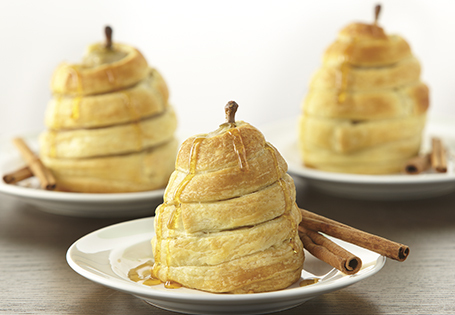 Honey poached pears wrapped in flaky pastry. Peel the pears, then set aside. Once the pears are tender, remove from heat and allow to cool. Simmer the poaching liquid until reduced to ½ cup. Cut crescent roll dough into ½-inch strips and wrap around pears, starting at the base and working up to the top. Place pears on prepared baking sheet. Bake 15-20 minutes, or until golden brown. Serve with a drizzle of the reduction.